Many birders keep a lifelist to remember all of the birds they have seen in their lifetime. Birding can be a competitive sport! The one with the fattest lifelist wins! 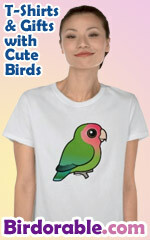 A cute gift for birdwatchers!